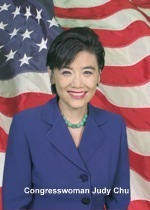 Congresswoman Judy Chu (CA – 32) introduced a written testimony on behalf of UNITED SIKHS at the House Judiciary Subcommittee Hearing on the Constitution, Civil Rights, and Civil Liberties on June 17, 2010 addressing concerns of racial profiling of Sikhs at airports. Unfortunately, as our community knows, Sikhs have routinely faced discriminatory practices at airports across United States. UNITED SIKHS submitted a written testimony on racial profiling geared toward Transportation Security Administration (TSA) policies that unfairly targeted Sikhs. This testimony emphasized the inconsistent policies regarding secondary inspections by Transportation Security Officers (TSOs), the lack of training, oversight, and unfettered discretion of TSOs, and the unfair targeting of a community that presents no national security risk to the U.S.
"Racial profiling threatens the very fabric of our nation's civil rights protections," said Chu. "UNITED SIKHS' work to expose the consequences that heightened security measures have had on the Sikh community is informative and instructive.I look forward to continuing our collaborative effort to fight injustice and discrimination in our country." The Congresswoman suggested that TSA work to fix these problems by introducing legislation to allow private action and get data, and then announced she would be writing a letter to TSA asking them for data about complaints and racial profiling for Sikhs and all other ethnic groups. A delegation of Sikh community members had met with Congresswoman Judy Chu as part of the week long Sikh Summit in Washington, DC, during which Sikh community members had talked about their concerns regarding existing TSA screening policies. Jaspreet Singh, Legal Director, UNITED SIKHS, has emphasized to Congresswoman Chu that "security policies that debase the Sikh community lead to the untenable choice of either maintaining their dignity or restricting their freedom of movement." Freedom of movement is a fundamental human right and if government restrictions become barriers to this fundamental human right, then Sikhs must stand united to condemn these policies. UNITED SIKHS is grateful to Congresswoman Chu for the opportunity to present the Sikh community's viewpoint and would also like to commend Amardeep Singh, Sikh Coalition, for testifying at the hearing at which he spoke convincingly about the effects of TSA policies on the Sikh community.